I’m No Superwoman by Susan E.
My guest blog post has been accepted by “Lost in Suburbia Stories”. I had fun writing it and hope you enjoy reading it. I always kept it with me, hidden, and I took it out only when I was alone. But one day, my best friend Tina discovered my secret. We had met for coffee. I opened my purse, and it fell on the table. Tina snatched it up before I could stop her. “Let me see that! 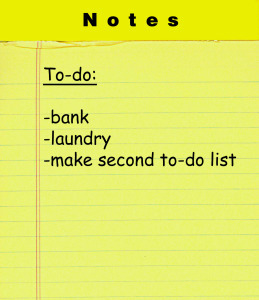 Is this your To-Do List? !” she said gleefully. “Give it back!” I said, but she held it out of reach. My To-Do List was two pages of single-spaced typing, and I had folded and unfolded it so many times that the edges were frayed. I had crossed off sentences and scribbled all over it. “Sign up and train for 5K race,” Tina read aloud. “Cool! What race?” She had recently completed the Chicago marathon. This entry was posted in Friendship, Goals and tagged Friendship, Goals. Bookmark the permalink. 3 Responses to I’m No Superwoman by Susan E.
Congratulations on being published in Lost in Suburbia Stories. Your essay made me smile. I’m glad to know I am not the only person with a list that never ends. I think I am going to take a nap…. We all have them, those dreaded “to do ” lists, but I like this one: have fun, be kind, smile and dance , take a moment……..